In the WWI AERO article (#165, Aug, 1999) concerning wing failures in the Nieuport 28 prompted me to put some ideas to paper, regarding those more familiar failures of the Fokker triplane. 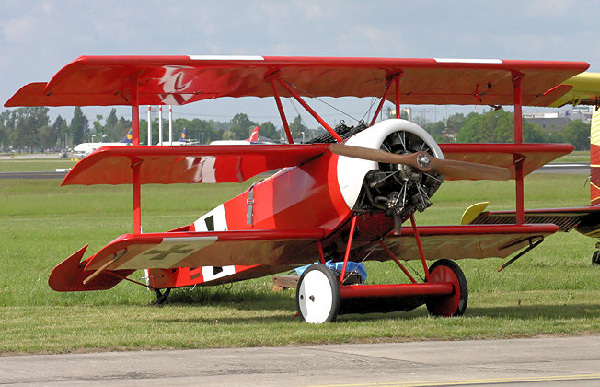 The reputation of Fokker aircraft for fragility was mainly the result of structural problems with the Dr.I triplane and D.VIII cantilever monoplane. The D.VIII wing problem was due to flexural failure (ie, they broke in bending); and the evidence indicates that this was due to production quality-control inadequacies rather than deficiencies of design or technical understanding. The Dr.I, however, is a different "kettle of fish" in that it experienced failures very like those of the Nieuport 28, namely that of "wing stripping." Unlike the D.VIII, the triplane was grounded not because of spar failure, but because of the disintegration of the secondary structure- wing ribs etc- whilst the spars remained intact. The similarity of the failures in the N28 and Dr.I is intriguing because the 2 aircraft are fundamentally different: one a biplane of almost sesquiplane proportions, the other a triplane of equal-chord wings. The N28 had thin-section wings, wire-braced; the Dr.I had thick sections and a cantilever structure very different animals. For me, the most interesting fact of all (and the most difficult to explain) has been that the failures always occurred in the upper wings of either aircraft - to my knowledge there are no reported incidents of failures in the lower planes. In the case of the 2 most notable triplane failures, the extent of the upper wingstripping was almost total, with fatal consequences for Lieutenants Gontermann and Pastor. It is of particular interest that, after the triplane was reissued with modified wings, the same type of failure still occurred - but to a more limited (and survivable) extent. At the time of the Dr.I grounding, after the 2 crashes mentioned, various theories were proposed to account for the failures. Sand loading of the Fokker F5 (the Dr.I prototype) had shown that the triplane cantilever wing cellule had excellent strength for its period; and it fell to those interested to create new (and unlikely) aerodynamic phenomena to account for the fatal discrepancy between experiment and practice. Because the ailerons of both Gontermann's and Pastor's aircraft were seen to detach, interest centered on the aileron supporting-structure and related internal componentry. Various reinforcements were introduced, and emphasis was placed on better internal protection of the glued structure by varnishing. (The peculiarity of upper wing failures had not, of course, gone unnoticed at the time. The possibility of the casein glue deteriorating, due to weathering, gave cause for concern - the lower wings being considered to be somewhat protected - debatable, of course.) Also poor workmanship was extensively uncovered in grounded aircraft and Fokker was urged to improve on this aspect of his production of further aircraft. However, as noted, failures continued to occur in the reissued aircraft. In the case of the Nieuport 28, the fabric of the upper-wing top-surface together with the entire leading edge would detach. On this aircraft, however, damage appears to have been selflimiting at this point: the rib tails and undersurface, for instance, always seem to have held up. This is just as well for the pilots concerned, since the (almost) sesquiplane proportions of the N28 could not have tolerated complete loss of the upper lifting area. Fortunately, the Nieuport carried its ailerons on the lower plane so that roll control was available - no doubt this helped survivability. Of all WWI aircraft, these 2 are the only ones I am aware of that suffered this type of failure as a generic fault. "Ballooning" of wing fabric was a known risk resulting from wing leading-edge damage. Wings failed simply through lack of strength. Wings failed due to a lack of stiffness. (True sesquiplanes- V-strutters, notably other Nieuport and Albatros models- are known to have occasionally lost a lower plane due to a lack of torsional stiffness) - but wingstripping seems mainly recorded for the 2 models in question. Since wing reinforcement better weather protection and better-built quality did not fully cure the triplane ills, then there was another factor at work. So what was it? I began by looking for a common factor. What is it that both aircraft possess which can cause almost identical failure in a wing- and why only the top plane? There are in fact, 2 unusual structural features present in both. Firstly, the main spars are very closely spaced so that the rib noses project unusually far forward of the spar group. The N28 spars are closely spaced, but maintain an orthodox drag-bracing arrangement of steel tube and piano wire. The Dr.I located the spars with a small separation, so that plywood closing-skins top and bottom formed a single-spar system, accounting for both drag and to a limited extent, torsion. The other critical feature present in both aircraft was the use of a plywood leading-edge contour panel. This was relatively unusual in WWI. British aircraft seem not to have used it at all, preferring intermediate riblets as leading-edge support; and from a quick appraisal of my library, I have identified only 5 aircraft which had this feature (I don't suppose this to be at a definitive.). These are the Pfalz D.XII Fokkers Dr.I, D.VI and D.VII, and the Nieuport 28 (possibly also the 27). Some aircraft wings were, of course, totally skinned in sheet plywood or aluminum; but with these exceptions, at least, complete fabric cover was the norm. The use of plywood leading-edge covering presents a problem in the attachment of fabric since stringing (ie, the through-wing stitching normally used) would be required to stop at the plywood-covered surface. This may account for the fact that both the triplane and N28 are reported as originally having the fabric tacked to the rib flanges rather than being sewn (which was considered to be the correct way). The fabric attachment itself is therefore suspect but the test still remains; why only failures of the upper wing? If the fabric attachment was the critical factor, then failures could have occurred in any wing with this feature, which would have included lower planes of both the triplane and the N28. Both aircraft have structurally suspect features in their wing leading-edges. In the case of the N28, the long rib-noses would produce large bending stresses (during violent manoeuvres) at their main-spar attachment locations. Large bending stresses can have attendant large shear stresses; and on the N28, these would exist in the thin poplar rib-webs (typical of the period). This is a very risky arrangement, since timber is not particularly strong when subject to shear loading along the grain - plywood is much better. (The N28 rib-noses had very little shear material anyway). The other suspect feature is that of the omission of rib-capping referred to in the recent WWI AERO article. These details appear peculiar to the N28, and are at the most extreme in the upper wing. There is little doubt that the upper wing leading edge was simply of marginal strength; and at first sight it seems odd that sandloading did not reveal this weakness. But of course this reveals a weakness of sand-loading. The chordwise distribution of lift, at high angles of attack, will not normally be represented by a heap of sand, since dry sand slumps to approximately 45 deg- forming a triangular load distribution with a centrally-located center of gravity. (This can be modified within limits by constructing walls along the wing edges.) Sandloading therefore successfully tests the wingspar adequacy, but is insufficient to the task of testing the rib nose strength (and remember that here we have 2 aircraft which resolutely held on to their spars, whilst liberally shedding secondary structure). This proof-loading problem is exacerbated by the fact that wing lift (particularly at large angles of attack) is largely generated by the negative pressure zone existing on the forward upper surface (see Fig 18- taken from SIMPLE AERODYNAMICS (1929), by Charles N Monteith.). The critical structural requirement under these loading conditions is to have adequate "peel" strength between the upper skin and the substructure (ribs and/or stringers etc). Both the N28 and the Dr.I were deficient here. The Nieuport was devoid of rib cap-strips or spanwise stringers at the critical location; the Dr.I leading-edge plywood was severely cut away at each rib, had no supporting stringers, and had only minor connection to the main spar. With this arrangement, a significant amount of the local lift- would have been transmitted in a peel condition from the plywood skin to the supporting ribs - there was no other load-path. Again, this is a very unreliable form of joint. Today, the attachment of wing skins to substructure remains a critical factor; in fact, where fuel is carried inside a wing much of the wing design is overridingly determined by this consideration. So, the Nieuport had a weak upper-wing leading edge and larger chord to boot. This could (as suggested in the WWI AERO article) be the complete answer to the N28 failures. But the Triplane had the same design condition on all wings, but only the top wing ever failed. So there was something else. The fact that real wings are of finite span (as opposed to the theoretically infinite span wing which is implicit in aerofoil section data) means that a real wing will attain a particular lift coefficient at an angle of attack somewhat greater than that apparent from he section-data. It also follows that wings of differing aspect ratio, but identical section, will generate different lift-intensities, to one another, when operating at the same angle of attack. The Dr.1 had aspect ratios of 6.8, 5.9 and 5.1 for the upper, middle and lower planes respectively. The wing section (tested as the Gottingen 289 section after the war) had a maximum lift coefficient of about 1.4. Making estimates for each of the triplane wings (working as independent surfaces), the planes would require 19.2, 20 and 21 degrees respectively to reach the maximum lift coefficient. When working at the same angle of attack (as in the aircraft alignment), the upper wing would produce a lift intensity about 9% greater than the lower wing. So could aspect-ratio be the cause of the Triplane wing failures? Well no, I am afraid not. A 9% increased lift intensity cannot be considered sufficient to always fail the upper wing before one or the other planes. Variations in material strength and build quality would both have similar (or greater) tolerance, which would occasionally bias the failure to one of the other planes. There has to be something else – something more emphatic. Paragraphs B and C are telling. The loading distribution noted is very significant over the biplane system described. A factor of 1.6 at high-lift coefficients cannot be ignored. The Triplane system with its relatively smaller wing gaps and pronounced stagger would almost certainly have a greater value than this. Together with aspect-ratio effects it is not unreasonable to suggest that the lift intensity of the upper wing of the Dr.I approached twice that of the bottom wing. This is certainly enough to test the upper wing integrity before the rest of the system. I would suggest that the Dr.I wing failures (and almost certainly those of the N28, too) occurred because lift-grading (particularly), together with aspect-ratio effects, caused the upper surface of the upper wing to be subject to much greater lift intensity than the rest of the system. This tested a leading-edge design of marginal strength, poorly made, to the point of collapse in particular aircraft. The leading edge failure continued back across the wing due to design details. Where rib tails, for example, were connected by a wire trailing edge, ballooning fabric will exert tensile loading in this wire which will then tend to "gather up" the rib tails and strip the wing. This would also destabilize the area of the aileron support structures, and so on. The strengthening of the wing aft of the spars and the improvements to build quality, carried out after the original failures, would have acted to prevent this catastrophic failure. But the root cause of the failure lift-grading) went unappreciated until after the war when investigations like those at NACA were conducted. It would be fascinating to know to what extent these factors were understood prior to 1918. I expect that the concentration of lift forces (as an intense negative pressure zone at the upper surface LE) was reasonably well appreciated by wind-tunnel investigators- if only by the application of Bernoulli's theorem to the visible flow patterns around test sections. Probably the effects of aspect ratio were understood- even if only qualitatively; but lift-grading would require much more complex investigation. Regarding the aspect-ratio issue; advocates of multiplanes (Horatio Phillips, for example) appear to have worked from the understanding that high aspect-ratio is a "good thing" (true) but not to have had evidence of the detrimental effects of interference between closely-spaced multi-plane wing systems. But such is the nature of progress - the testing of ideas. It took the lives of airmen to drive the investigations which led to today's understanding of these matters and which allow our complacent and sometimes arrogant review of history. A final thought. It is theoretically possible for the Fokker triplane to remain airborne on its 2 lower planes alone (of 9.9 square metres area). The stall speed would be about 64mph. No doubt, when both Gontermann and Pastor found themselves in dire straits, they did the natural thing: to pull back on the stick even though the aircraft was deeply stalled. Maybe if they had first pushed ... ?